Team: Mario Saia, Dino Barbarese, Vladimir Topouzanov, Gabriel Juneau, Virginie Legast, Donald Marquis, Marc Pape, Yvon Théoret, Naomi Frangos. 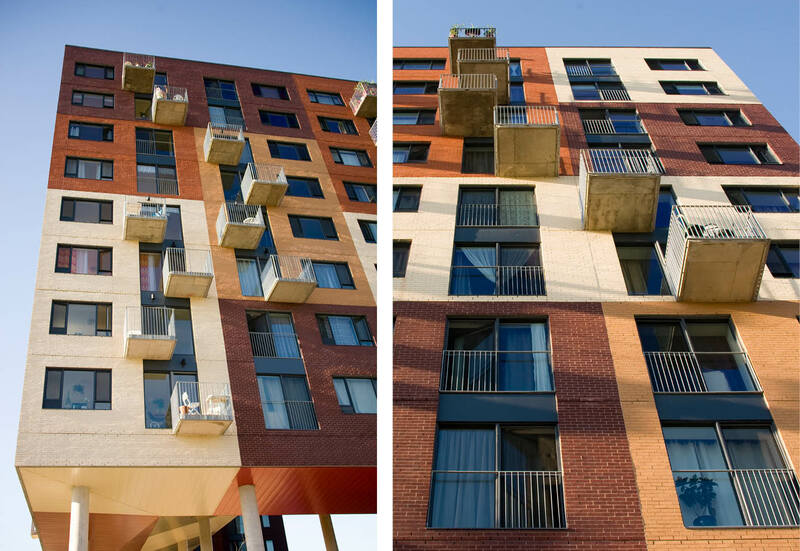 This building is a component part of a larger planning proposal encompassing three large-scale affordable housing blocks. The site is located at the city’s eastern edge not far from the St. Lawrence River. The planning parti for the entire development project was predetermined by the Municipality and was put forward to the Architects as a given. The building in question sits at the northernmost end of the site, more precisely at the intersection of boulevard Gaëtan-Laberge and rue Rhéaume. The boulevard is a broad divided artery that follows the river’s edge for many kilometers, while rue Rhéaume is a more conventional street. The eastern view from the site is a broad panorama overlooking Parc Therrien, the Saint Lawrence River, and the distant hills of the Montérégie. Westward, the view looks towards the Montreal’s city centre and Mount Royal. The program calls for the integration two separate nonprofit housing cooperatives, the first one, Entre deux ages, consisting of 107 dwelling units and destined for quasi-autonomous seniors, the other, Cooperative rêve bleu, comprises 19 units which are intended for single, mentally handicapped women over 50. On the ground floor, the building also houses the common facilities, that is to say, a dining hall, a kitchen, an assembly room, and two administrative offices. The dining hall is fully glazed on three sides with unobstructed views onto the courtyard at the rear and to the distant river and Montérégie hills in the front. A terrace for the benefit of residents and staff is located on the roof of the building. The common facilities are to serve both cooperatives. The site was once used as a dump for domestic wastes and non-organic matters. The Ministry of the Environment of Quebec stipulates that no building can be built on land where the biogas emissions exceed 5%, unless special security provisions are met. These measures include putting in place a system of specified passive and active ventilation systems around the building’s foundation walls or an open space of 5 meters or more between the soil’s surface and the habitable parts of the building. 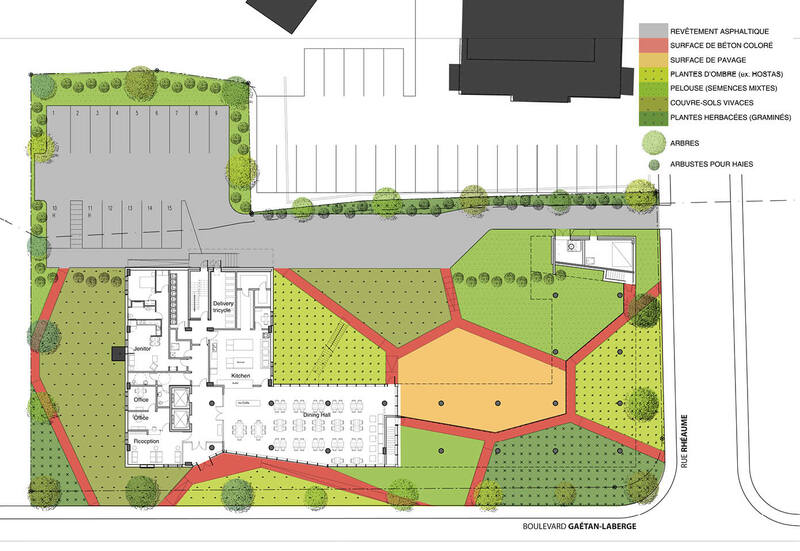 The Urban Planning Service of the city of Verdun determined the specific placement criteria of the building with respect to the site as well as the overall volumetric parameters. Amongst these is a requirement that the building’s perimeter follows closely the configuration of the street. The north half the building is elevated on pilotis to meet the Ministry of the Environment’s norms for securing a spatial gap between contaminated ground and housing units. The Ministry accepts the notion that the 5-meter wide gap could either be measured vertically or horizontally. The ground related part of the building sits on the less contaminated area of the construction site; the other part is on pilotis. The building is configured in the form of a ‘U’, partly to distribute its mass more evenly throughout the site, and partly to create a semi-enclosed garden court. Its 10-storie height corresponds to the height of the neighboring new towers. Although more that half the ground floor is elevated on pilotis, the overall façade of the building still constitutes an effective urban wall that defines the riverfront street. For the most part, the dwelling units are strung along one side of a corridor. 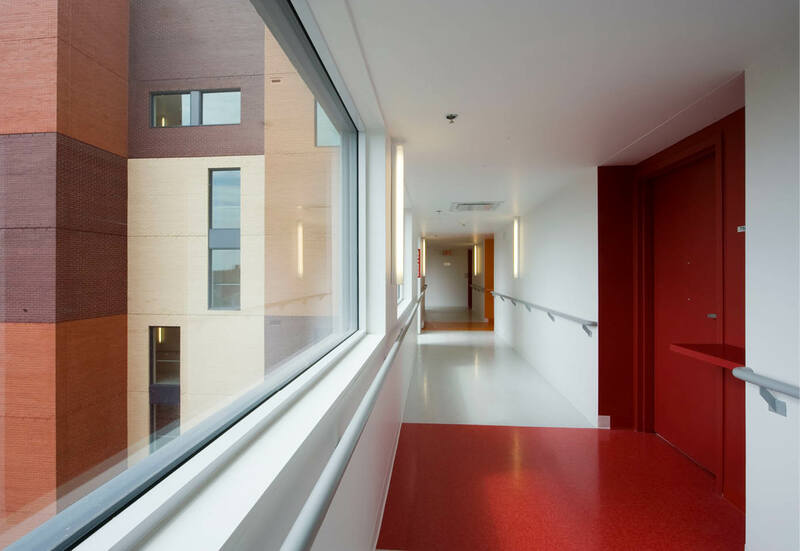 This option allows for a less deep building mass and thus assuring a less oppressive and brighter area under the lifted section of the building, and provides naturally lit corridors with a view on the courtyard. 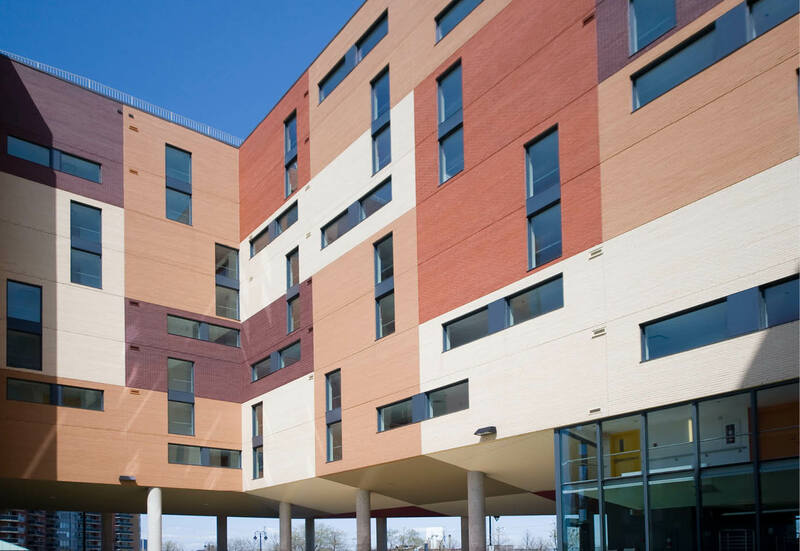 Although the facades are generated by the plan, their design premise is based on a notion that certain façade elements can be manipulated without compromising the integrity of the parti. 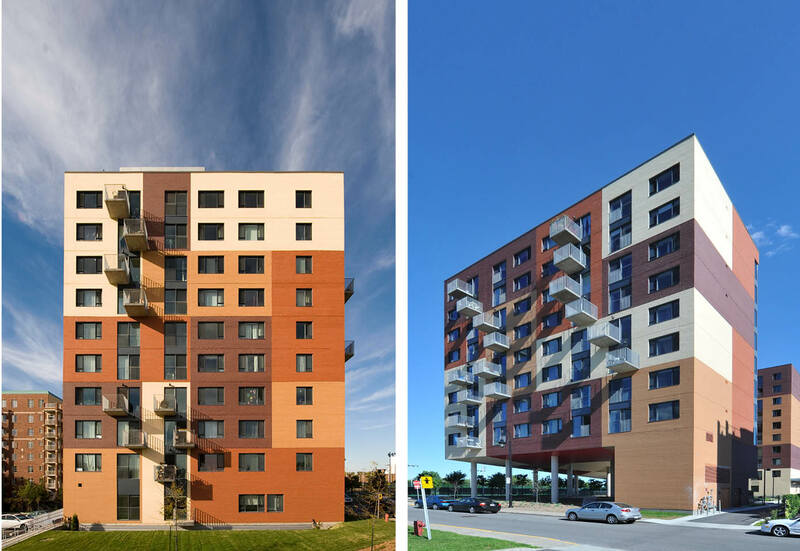 First, color is used independently of the morphology of the plan; second, color is used as a graphic process to manipulate the scale of the building and to break down the repetitive nature of the plan; third, balconies are located in a playful manner to avoid the traditional monotony of vertically lined-up projections. One can anticipate that this color-coding will help residents identify their units from the outside. 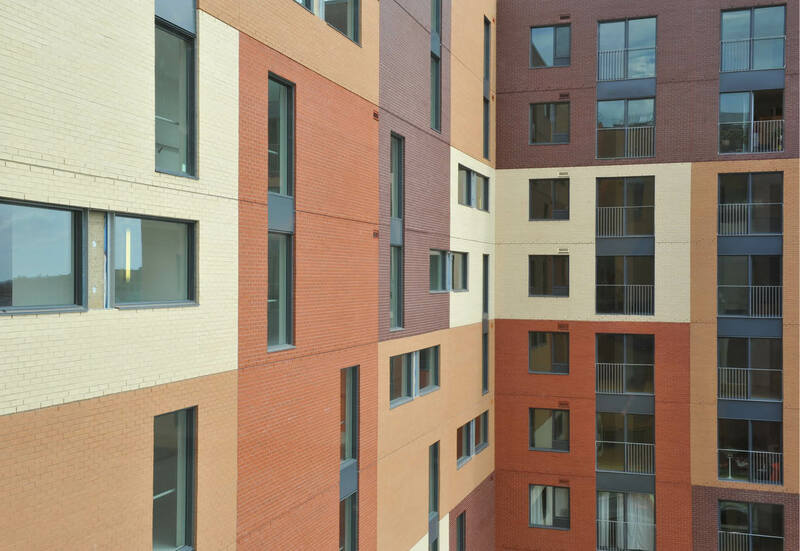 The use of color for the rear façade of the building follows a similar logic, though the design and layout of the windows are radically different: these relate to public corridors rather than habitable spaces. The window pattern provides an additional level of playfulness on both the inside and the outside. Furthermore, it reinforces the expressive idea that front and rear are functionally very different. 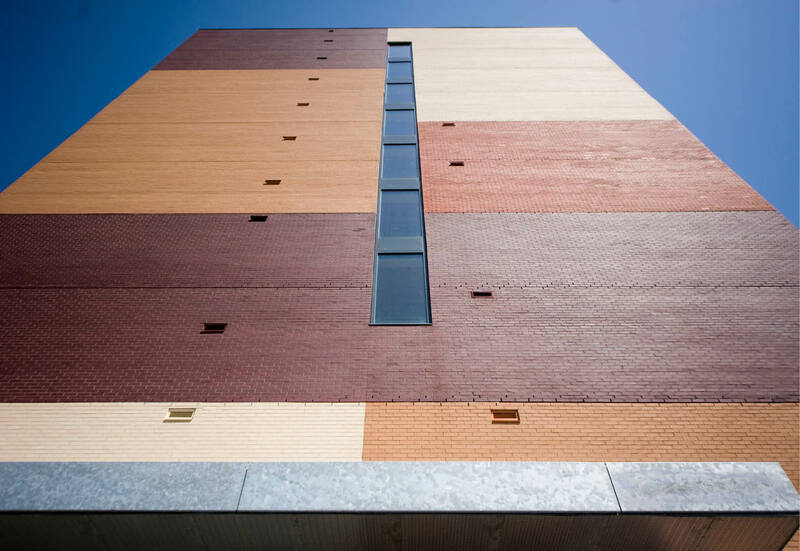 The predominant cladding material of the building is clay brick. The color palette and the texture of the brick are those of the neighboring houses. 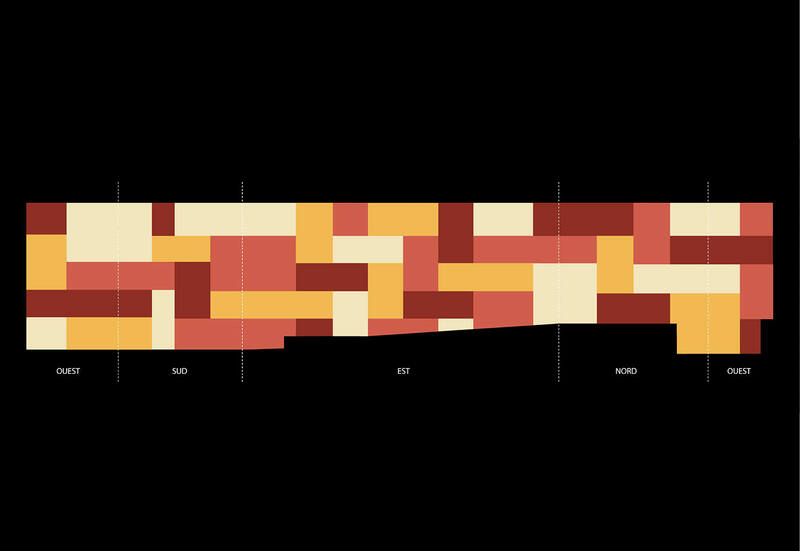 The gamut ranges from ochre, to burn sienna, to terra cotta, to dark brown. 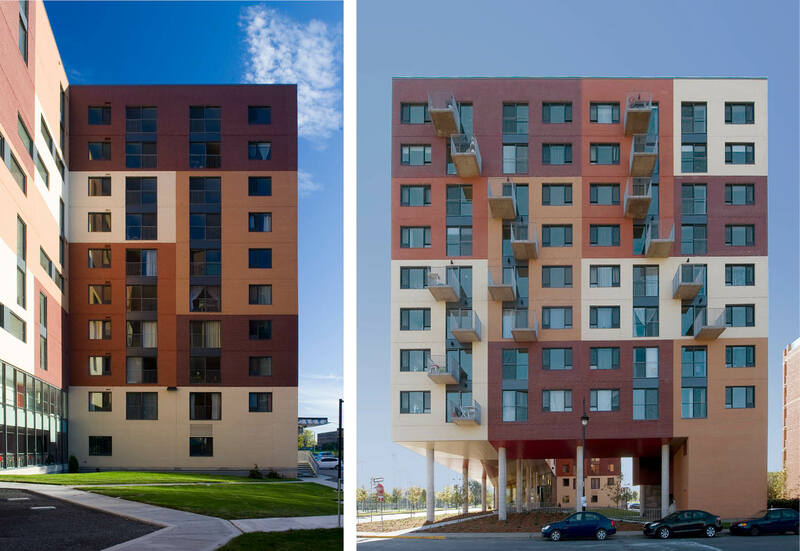 The colored elements of the façade regroup either two or four dwelling units, both horizontally and vertically. 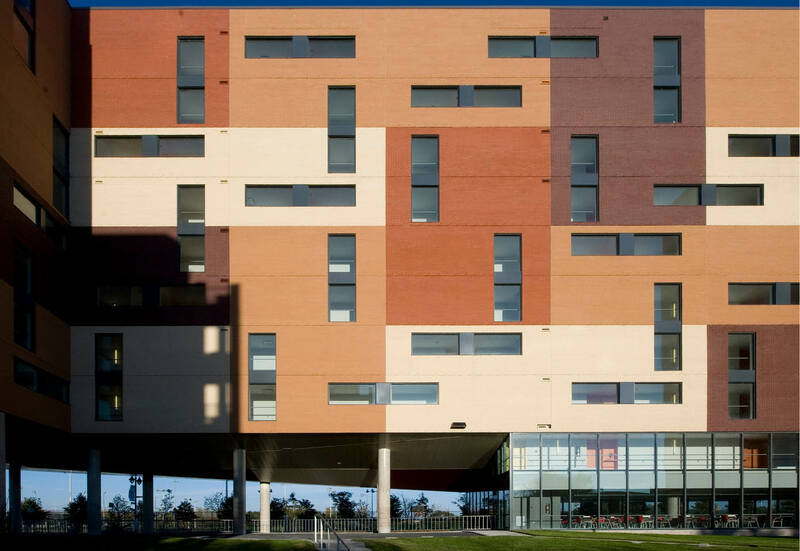 The use of color and the graphic composition of the façades are governed by a subjective attitude about the manner the building speaks of itself. The objective is to create large joyful walls by means of color. Subjectivity rather objectivity, are the inevitable means to playfulness and joy. All the common facilities are ground-related and connected to an outdoor terrace located in the corner of the court. A network of pathways leading to different parts of the garden subdivides the open space into different polygonally shaped parcels of land. Each of these is treated in different manner: some are paved, others are covered with grasses, and still others are sodden and planted with various species of trees. On account of the contamination of the soil, the ground floor facilities are raised on a slight earthen burm to provide additional protection for the facilities. The raising of the land and its subsequent slopes and ramps gives an additional interest to the landscape. A hedgerow of low bushes surrounds the entire site. 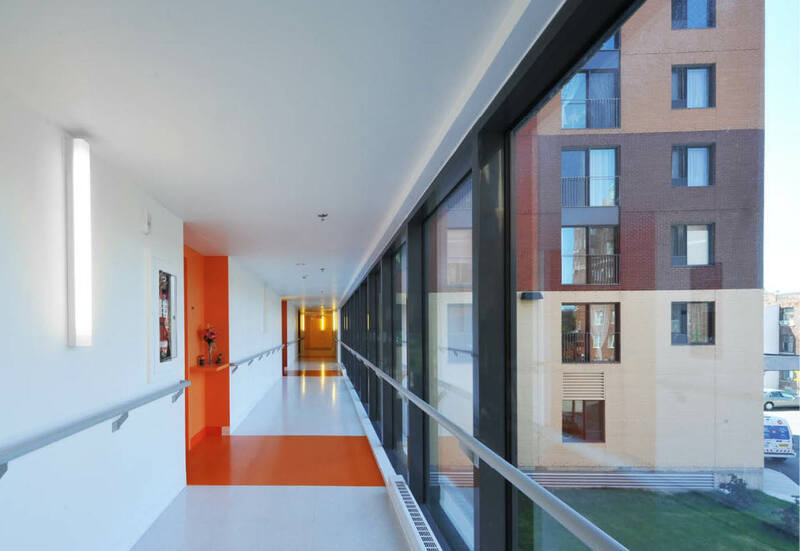 All the dwelling units and the common facilities follow the Quebec norms for such housing, and are designed to respond to the needs of the partially handicapped.